A 47-year-old East Boston man recently entered a not guilty plea to leaving the scene of an accident and motor-vehicle homicide at the Chelsea District Court after being accused of being involved in a hit-and-run car-pedestrian accident in Revere, according to the Chron. Prosecutors say that the man made an attempt to fix the damage on his SUV that was caused by the accident. He is being accused of striking and killing a 22-year-old pedestrian just before 6:00 a.m. The young woman was taken to the hospital where she was later pronounced dead. Prosecutors believe that the man attempted to make repairs on his vehicle to cover up the damage and then attempted to wash it down with bleach to hide and further evidence. The man is currently being held on a $25,000 bail. Our Boston personal injury attorneys understand that pedestrians are extremely vulnerable to car-pedestrian accidents near our busy roadways. To help reduce the risks of such serious accidents, the Institute for Human Centered Design, recently discussed plans of Shared Space, which is a street design concept to help protect pedestrians traveling along our roadways. Shared Space is already a popular part of European roads, according to the Boston Globe. This theory aims to reduce the number of curbs in our area. Researchers of the program believe that curbs are the enemy on our roadways as they serve as a barrier that determines which part of the roadway belongs to the vehicles and which parts belong to the pedestrians. Shared Space also frowns upon the use of traffic lights, road markings and street signs. Under the Shared program, streets are stripped down and all physical and psychological barriers are eliminated. Without these traffic regulating devices, motorists and pedestrians are forced to share the area efficiently and safely. Supporters believe that the roads can actually be safer by making them more dangerous and requiring everyone to think a little bit more. There’s an area inside City Hall that is called the Traffic Management Center in which live video is surveyed of various busy intersections. A technician is hired to monitor these areas and make appropriate stop-light adjustments to ensure that the traffic flow’s steady. Whereas the focus of this technician has always been to get our Boston motorists traveling quickly and efficiently, a number of pedestrian advocates recognize the increase in on-foot traffic and are pushing to shift the focus from vehicles to pedestrians. 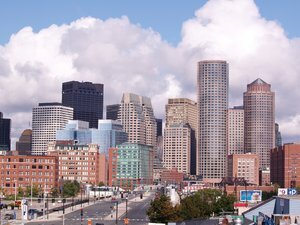 If you or a loved one has been injured in a pedestrian-car accident in Revere or elsewhere in the Boston area, contact Massachusetts Personal Injury Lawyer Attorney Jeffrey S. Glassman for a free and confidential appointment to discuss your rights. Call 1-877-617-5333.